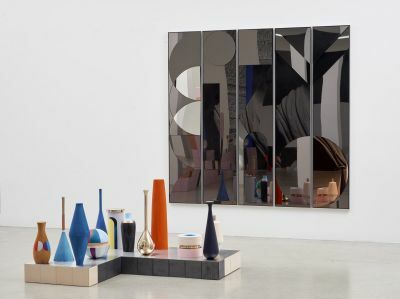 Jessica Silverman Gallery is pleased to present “Forum,” a solo show of new sculptures, multifaceted mirrors, drawings and wallpaper by Claudia Wieser. Wieser creates work for imagined other worlds, which she then manifests as atmospheric installations. The works in this show are inspired by the ancient Roman forum as a meeting place, site of public debate and nascent location of democracy. The exhibition as a whole is Wieser’s way of processing recent political dramas and searching for forms that relate to the longer history of humanity. Wieser apprenticed as a blacksmith, then worked in the film industry, before doing an MA in painting and sculpture at the Akademie der Bildenden Künste in Munich. These experiences enabled her to become a virtuoso maker in diverse materials, including wood, mirror, gold, copper, ceramics, ink, acrylics and photographs. Wieser relishes the intimacy of making things with her hands and the mastery of using machines from computers to rudimentary lathes. A devotee of formal experiment, she takes particular interest in surfaces from watery washes and ultra-flat matte finishes to glossy glazes and trompe l’oeil depictions of cement. Inspired by the history of art, design and architecture, the show is in conversation with diverse art histories from the aforementioned ancient Rome to the Bauhaus, and from Bas Jan Ader to Hilma Af Klint. The exhibition includes two kinds of mixed media works on paper – abstractions and images of birds with geometric shapes. Both play with freedom, equilibrium, and the mathematics of nature. Like her sculptures, they seek the fundamental formal relations of life and beauty. Claudia Wieser (b. 1973, Freilassig, German) did an MA in Painting and Sculpture at the Academy of Fine Arts, Munich, after an apprenticeship as a blacksmith and a stint in a film production company. She has exhibited at The Drawing Center in New York, the Kunsthalle Nuremberg and the Kunstmuseum Stuttgart in Germany, the Museo d ́Arte Contemporanea in Genoa, Italy and the Contemporary Art Museum St. Louis in Missouri. In March 2018, Wieser will be included in Hinge Pictures: Eight Women Artists Occupy the Third Dimension at the Contemporary Arts Center in New Orleans. Her work has been acquired by many prominent collections, particularly in Germany, including the Contemporary Art Collection of the Federal Republic of Germany, DekaBank Art Collection, Deutsche Bundesbank Kunstsammlung, Helaba Art Collection, Lenbachhaus, and Sammlung Goetz. She will enjoy a solo exhibition at the Smart Museum, Chicago in September 2019. She is represented by Marianne Boesky and Sies + Höke. The artist lives and works in Berlin. This is her first show with Jessica Silverman Gallery.